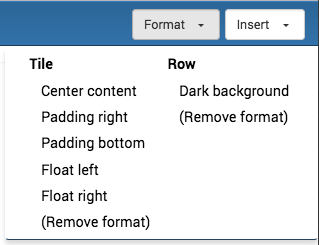 How to install new Formats for use in the menu. Is there a way to distinguish a row as being fluid vs being fixed? See the diagram below: [image] Additional context I'd like to be able to do a layout like the one in the screenshot, as you can see the top "hero" content area (labeled Fluid container) fills the width of the page while the the next area (labelled Fixed container) has a defined width. I'd like to be able to achieve both easily in the same layout using Mosaic. 1letter, Does this go into the registry.xml file in the /profiles/default/ directory? Thank you! looks like its working. I appreciate the help. Is there a way to do this ^^^ in a fat theme? Great, thanks, avoiding wasting time on this.